Rothification is the compulsory conversion of some or all traditional defined-contribution plans to Roth-like plans. While that definition can seem like a mouthful, it may soon be important to understand the concept and what it means for tax reform. Rumor has it that policymakers are considering using Rothification to raise revenue as part of a broader tax reform package. Despite this, Rothification’s ability to raise long-term streams of revenue remains highly suspect. What follows is a brief description of our current retirement savings framework, how Rothification could change it, and an analysis of the potential revenue gains. Americans can generally elect to save for retirement using either a traditional defined-contribution retirement account (such as a 401(k) or an IRA) or a Roth-style account. 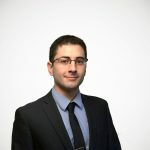 There are many eligibility requirements and other technicalities that differ between the two, but the differences with regards to tax policy are relatively simple. A traditional 401(k) is funded with untaxed income and taxed upon withdrawal, while a Roth 401(k) is funded with after-tax income and may be withdrawn tax-free. Both options are preferential to ordinary, nonretirement savings and investment plans. Without a 401(k) or IRA, both an individual’s initial investment and the returns on the investment are taxed. Generally, if you assume you will face the same tax rates throughout your life, the choice between a traditional 401(k) and a Roth 401(k) is unimportant, as the two will yield equivalent after-tax returns. The math behind the interaction between investment and taxation is somewhat confusing, so the following chart and explanation can help illustrate the difference. 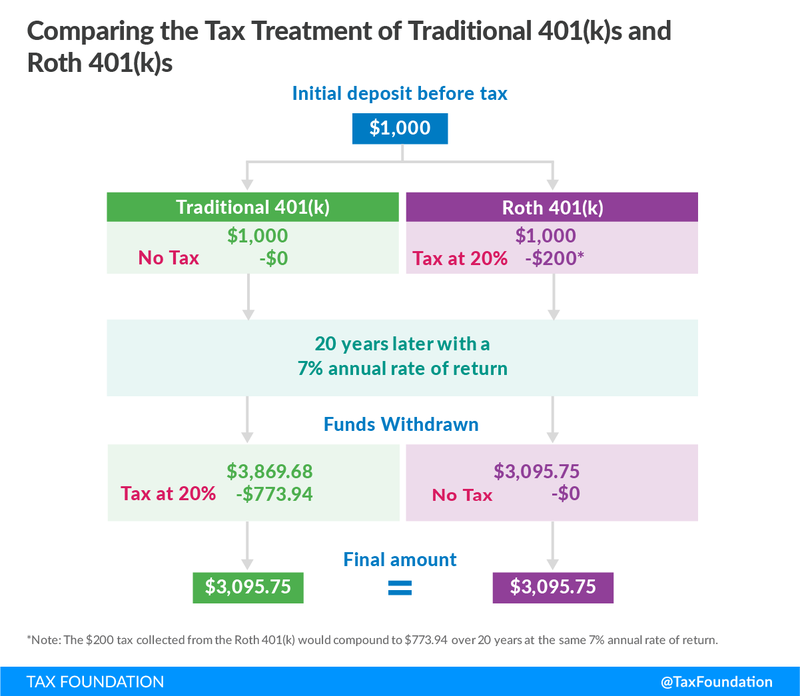 Assuming a constant tax rate of 20 percent, an initial deposit of $1,000 of untaxed income would result in $1,000 of principal in a traditional 401(k) and $800 in a Roth 401(k). After allowing the investments to mature over 20 years at a 7 percent annual rate of return, the traditional 401(k) would grow to $3,869.68 while the Roth 401(k) would only grow to $3,095.75. However, upon withdrawal, the traditional 401(k) would be taxed and drop in value to the same $3,095.75 as the Roth 401(k). Policymakers will attempt to find revenue streams that can be used to pay for tax cuts in potential future tax reform. The Joint Committee on Taxation (JCT) recently published a report in January on federal tax expenditures and estimated that the tax deferral from defined contribution plans could cost the federal goverment $583.6 billion between 2016 and 2020. Such a figure represents a tempting amount of revenue that policymakers could seek to recoup through Rothification. While Rothification would immediately generate large gains in short-term revenue, it does so by sacrificing an equal or greater amount of future revenue. On net, and over a long enough time horizon, Rothification would not increase federal revenue and might even reduce it. The $583.6 billion figure quoted from the JCT above does not represent taxes that will never be paid. Instead, it represents taxes that will be paid at a future time, when individuals retire. Rothification mainly alters the timing of collecting taxes, and using it to raise revenue has bluntly been described as a “budget gimmick.” Lawmakers trying to raise revenue over a 10-year budget window might consider using Rothification, but doing so would completely disregard the true long-term effects. Additionally, traditional retirement plans offer other policy advantages over Roth plans, such as capturing super-normal returns on investments. Even though private investors might be indifferent to a traditional 401(k) versus a Roth 401(k), the federal government would probably earn more revenue through taxing traditional 401(k)s. The government has a lower discount rate than private investors do, and therefore would be losing money if it taxed retirement accounts before they could mature in the private market. Traditional retirement plans avoid this by simply taxing earnings upon withdrawal, and thus could potentially capture much more future tax revenue than Roth plans. Edit (9/18/2017): The original language of this piece indicated the JCT estimate covered only traditional 401(k) plans. It has been corrected to refer to all defined benefit plans, including Roth 401(k)s.